The John and Mary Osman Braun and Hogenberg Collection contains a variety of maps from the late 16th and early 17th centuries, primarily from the Civitates Orbis Terrarum (Cities of the World) by Georg Braun and Franz Hogenberg. The Civitates is considered one of the first modern atlases and it captures an exciting glimpse into the past through the eyes of some of Europe’s most skilled artists and engravers. In addition, the Osman collection also contains nearly three-dozen other maps, including some by rival cartographers. Though not a part of the Civitates, the additional maps help provide a larger context for the styles and locations thought important at the time. 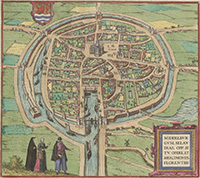 To the right is one of our three maps of Middelburg in the Netherlands.